On Friday, July 15, goaltender Samuel Montembeault took to the rink at the Florida Panthers’ IceDen. In the midst of his second development camp, he skated out to his crease, donned in a red jersey for the team’s traditional end-of-camp, intrasquad scrimmage. He prepped himself in his cage. The puck dropped at center ice. For 23:30 of a 25-minute half, the former QMJHLer shut-out the opposition, spurring a massive comeback. He stonewalled the opposition, robbing 2016 first-rounder Henrik Borgstrom point blank with a sensational cross-crease save. At face value, it was a superlative outing by one of a cadre of goaltending prospects the Panthers have waiting in the wings. However, it also solidified Montembeault’s position atop the Cats’ goalie prospect pool. And now, heading into his first professional season with the AHL’s Springfield Thunderbirds, that distinction is his to lose. Hockey’s Future describes Montembeault as a talented netminder, one harboring the potential to eventually start at the NHL level. His main strengths lie in his agility and stature; tall, light, and rangy. His stats aren’t too shabby, either. Over three seasons with the Blainville-Boisbriand Armada, the Quebec native was a top-twenty goaltender in terms of save percentage, despite eclipsing .900 just once. His goals against average (GAA) was much stronger — finishing in the top six during each year of his QMJHL tenure, he aggregated a career mark of 2.58 over the course of 113 games. Despite the Armanda finishing as the 6th-worst team in the league, Montembeault had the 6th-best goals-against average and save percentage in the league…while also recording (three) shutouts. The Armada ended the year allowing the 4th-fewest goals in the entire league thanks mostly in part to Montembeault. However they were handicapped by having the QMJHL’s 2nd-worst offense after losing several key scorers to graduation at the start of the season. His numbers may not have the luster of those of his contemporaries, but one thing is evident — even in the early stages of his development, Montembeault has the ability to steal a game, to carry his team, to play a crucial part in a playoff push. And when that push comes to shove, he’s capable of turning his game up a notch. The QMJHL’s second-ranked goalie in career GAA strong showing after solid showing together during the 2015-16 postseason, compiling a .925 save percentage and 2.45 GAA while posting a shutout en route to a second-round berth. The jewel of his 11-game run came in the first round, where a 56-save performance clinched a series victory against the heavily favored Vald’Or Foreurs. Montembeault has said that he hopes to crack the big leagues within the next five years. If he continues to progress at his current clip, that span could be shortened. He might not have been the top-rated goaltender at the 2015 draft, but the Florida Panthers had Montembeault at the top of their positional draft board. At the 2015 CHL Top Prospects combine, the goaltender tested for — and finished first in — the specialized reaction, agility, and movement categories, a tip-of-the-hat to his exceptional athletic ability. Along with his combine-proven reflexes, Montembeault’s in-league performances point towards an eventual starting-caliber netminder. Just where, though, does he slot in with the rest of the goalies in the Panthers’ pipeline? To put it short — at the very top. Currently, the Panthers’ positional prospect pool hosts a grab-bag of talent; some panning out, others, not so much. The 6-foot-3, 192-pound Montembeault joins five other goaltending prospects — Ryan Bednard, Sam Brittain, Evan Cowley, Hugo Fagerblom and Colin Stevens — all at varying stages of the developmental process. 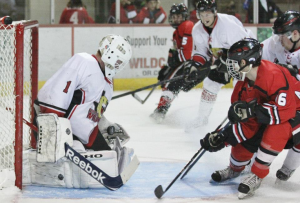 Bednard, a lanky 6-foot-4 goalie out of Macomb Township, Michigan, posted solid numbers while guarding the crease for the USHL’s Youngstown Phantoms, but, like many of his Panthers counterparts, opted for the collegiate route. Slated to join Bowling Green’s hockey team, it’ll most likely be three-to-four years before the former 2015 seventh-rounder inks an ELC. Towering at 6-foot-6, Fagerblom was also nabbed in the seventh round, 182nd overall in the 2014 Entry Draft. However, if Bednard’s chances at making an eventual impact are slim, Fagerblom’s are nonexistent — a product of the Swedish domestic system, the Boras native has yet to crack the SHL, foundering at the U20 level. With his draft rights set to expire, Fagerblom could soon find himself out of the Cats’ prospect pool. A trio of college goalies rounds out the group. The greenest of the bunch in terms of professional experience, Evan Cowley was nabbed in the fourth round of the 2013 draft and is entering the final season of his collegiate career. A product of the USDP, the 6-foot-5 Cowley has played second fiddle thus far at the University of Denver, first backing fellow prospect Brittain before serving as an understudy to Tanner Jaillet. Solid to date in spot duty, he will once again get a crack at the starting job — unless an abysmal appearance at the Cats’ development camp-closing scrimmage portends things to come. Brittain and Stevens, both former NCAA divisional goalies of the year, have had a rough go of things to open their professional careers. Another fourth-rounder, Brittain struggled through 25 AHL games, posting a .906 save percentage while backing up career minor-leaguer Mike McKenna in Portland. His fortunes inverted from the prior year — stellar in a handful of AHL contests, Brittain had a season to forget in the lower-level ECHL, notching a sub-.900 save percentage along with a 2.71 GAA in 27 tilts. A graduate of Union College, Stevens also endured a rough-and-tumble rookie campaign. As the primary goaltender for the ECHL’s Manchester Monarchs, the native of Niskayuna, New York, managed below-average totals, managing a .908 save percentage and a 2.77 GAA. Montembeault, held in high regard by the team, injects a dosage of depth into the organizational depth chart. Standing an outside shot of cracking the opening night roster, he figures to report to Springfield, where management will wait with baited breath, anxious to see if the Quebecois teenager will live up to the hype. Given his résumé, they might not need to wait very long. After all, they made him the highest-drafted goaltending prospect in the organization for a reason.